Arched top, wood case with 7-Ply Construction. These cases are lightweight and durable, this modern yet classy handcrafted case features a convenient climatic protection system to protect your investment with great style. Notable features include a soft Navy Blue Plush padded interior with accessory compartment, well-padded neck and body support, sturdy hinges and latches. 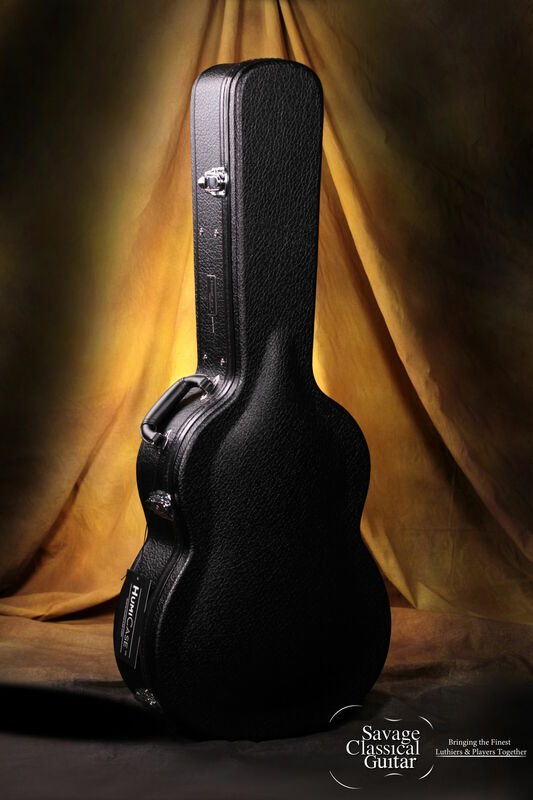 HumiCase™ offers a full line of affordable cases specifically designed to protect acoustic guitars from the elements. With both the novice and professional musician in mind, HumiCase™ products include everything needed to ensure safe, proper humidification and protection. Humicase™ understands the need for a humidity controlled environment for classical and acoustic guitars. The self-humidifying system helps prevent cracking, shrinking, and other damage due to changes in climate and temperature. After years of testing, HumiCase™ has developed a product that has proven itself effective in decreasing the risk of instrument damage due to dryness. HumiCase’s™ patent pending dual action humidity control system is mounted in each case, and designed to maintain continuous humidity control.